Drew Dowling started handling as a junior handler when he was 15. 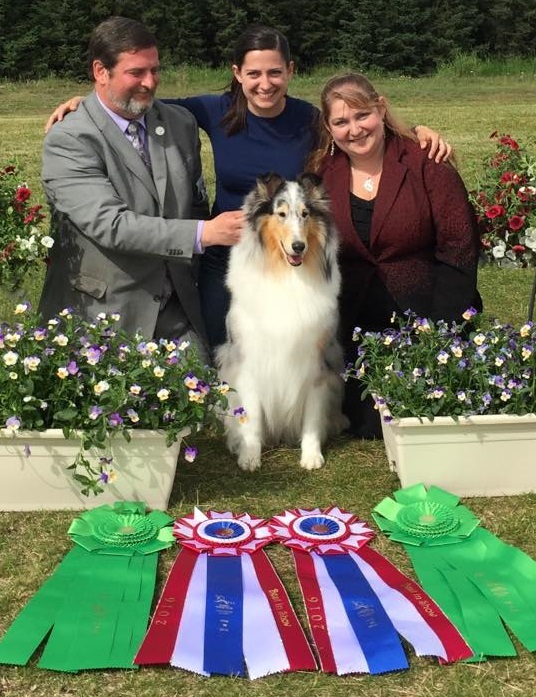 His accomplishments include 13 Best in Shows, many Best in Specialties, and many group wins and placements.He also produced Courtney & Lindsey Dowling who are now part of the handling team. Lindsey & I (Courtney Dowling) started showing and training dogs as soon as we could walk and started in Junior Showmanship as soon as we were eligible.We gained handling experience with other breeds by helping our dad and his friends take in the “filler” dogs, which we all knows means the untrained point stuffers:)Although at the time we did not realize how those experiences would assist us in our handling ability, we look back on those days and are grateful that we were able to have a variety of experience with many different breeds and dog personalities.Even though we weren’t “supposed” to win, we always went into the ring and did our best! Lindsey was the number one junior handler in Alaska for three of the 7 years she was a junior handler.She qualified and made it down to the final twelve at the Eukanuba National Invitational showing a Rough Collie.Lindsey has finished, major pointed, received group placements and wins, and several Best in Shows with a variety of breeds including: Collies, Aussies, Bulldogs, Flatcoated Retriever, Pembroke Corgi, German Shepherds, Papillons, and Portuguese Water Dogs. My claim to fame in my junior carrier includes being awarded Best Junior Handler at the Collie Club of America National Specialty in 2002.I have several Best in Shows & Reserve Best in Shows, many Best in Specialties, group wins, and placements, and have finished and major pointed many different breeds. It is our philosophy to always do what is best for the dogs we show!! I hope you enjoyed a little background on the Dowling handlers.Please enjoy the pictures and info on the dogs we are currently showing.